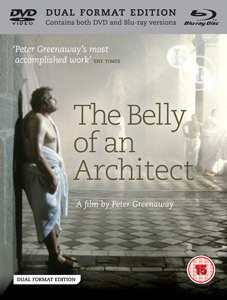 Visually striking and formally precise, Peter Greenaway's fourth feature, The Belly of an Architect, is a complex and sometimes disturbing film about an obsession that devastates a man's marriage, health and career. Distinguished American architect Stourley Kracklite (a nuanced, muscular performance by Brian Dennehy), is invited to Rome with his young wife, Louisa (Chloe Webb), to supervise an exhibition devoted to his hero, the visionary eighteenth-century architect Étienne-Louis Boullée. Dedicated to honouring the past, Stourley does so at the expense of his present, driving his neglected wife into the arms of his rival, Caspasian (Lambert Wilson). Wracked with abdominal pains, jealousy and paranoia, he slowly loses his grip on all that is important to him. Flemish composer and multi-instrumentalist Wim Mertens provides the soundtrack, with additional music by avant-garde composer and guitarist Glenn Branca. The Belley of an Architect arrives on UK dual format (including both DVD and Blu-ray versions of the film – but you should know this by now) on 18th June from the BFI at the RRP of £19.99. Illustrated booklet with essay, interview, biographies and credits by Michael Brooke, Donald Ranvaud and Marcia Landy.